Portable 8.5 inch writing pad, lightweight and practical. Have one in your briefcase, you will never worry about searching for a pen again. Write with the included plastic stylus or by your finger, and erase by a simple touch of the button, easy operation and high efficiency. Highly recommended for kids, students, businessmen and office staffs. 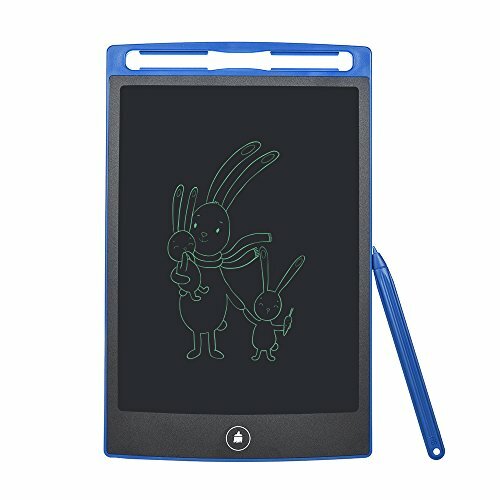 Eye-protecting Ultra-bright LCD Screen: Pressure-sensitive, write and draw by included stylus or finger without any delay, smooth writing experience. Eco-friendly & High Efficiency: Just press the button to erase all, quick to reuse and save a great deal of paper. Ultra-thin Design: 8.5 inch screen, 0.5mm thickness, compact and durable enough to carry around freely. Long-time Retention: Keep the fonts until cleared, a good helper for leaving message with magnet in the back. Long Service Time: Built-in replaceable battery with up to 2 years life, re-writable for over 100,000 times. Very Wide Application: Useful in lots of places and suitable for all age people. Businessmen, office staffs, students and kids will love it very much. The deaf and dumb person also can use it to communicate easily with others.